Thursday, June 28, 2018, at 16:00, in the Vatican Basilica, the Holy Father Pope Francis, celebrated the Ordinary Public Consistory for the creation of 14 new Cardinals, for the imposition of the cap, the delivery of the ring and the assignment of the title or diakonia. This was the fifth Consistory of the Pontificate of Pope Francis. The origin of the Cardinals, from various countries of the world, expresses the universality of the Church, which continues to spread God's merciful love to all people on earth; these are the words announced on May 20th by Pope Francis at the end of the Regina Coeli di Pentecoste. 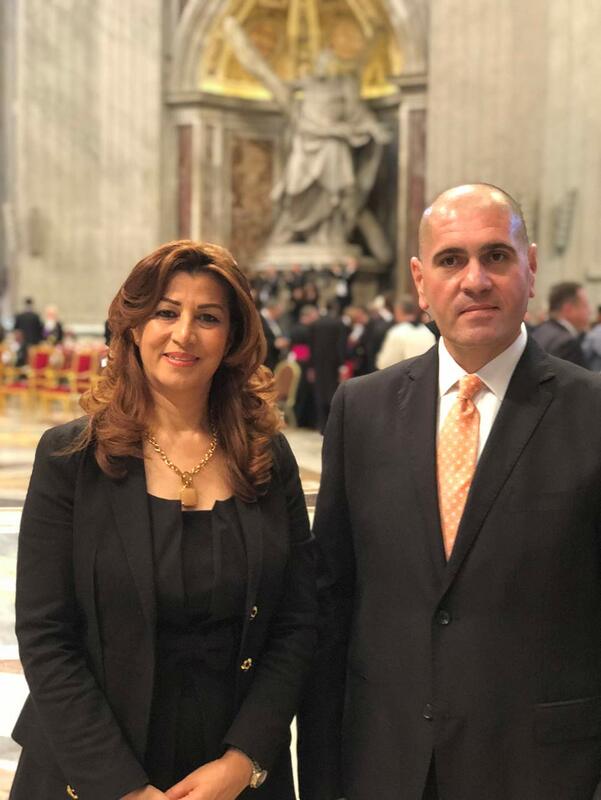 Dr. Rezan Kader, High Representative of the Regional Government of Kurdistan in Italy and the Holy See, participated in the celebrations on behalf of the Kurdish people and witnessed the support and closeness of the Holy Father to the Chaldean Church and in general to all Christians present in the area, in the creation of the Cardinals in fact there is His Beatitude Louis Raphael I Sako, patriarch of Babylon of the Chaldeans who represents Iraq, So we come to the presentation 14 of the Cardinals. As announced, Cardinal Luis Raphael I Sako, patriarch of Babylon of the Chaldeans in Iraq, becomes. The Italian Cardinals are three: De Donatis, Vicar of Rome, Giovanni Angelo Becciu, (substitute of the Vatican Secretariat of State until August, when he will assume the leadership of the Congregation for the Causes of the Saints) and Giuseppe Petrocchi, archbishop of L'Aquila. Luis Ladaria Ferrer, Spanish Jesuit, from 1 July 2017 Prefect of the Congregation for the Doctrine of the Faith; Konrad Krajewski, Polish, Papal Alumnier; Joseph Coutts, archbishop of Karachi, Pakistan; Antonio dos Santos Marto, bishop of Fatima, in Portugal; Pedro Ricardo Barreto Jimeno, Jesuit, archbishop of Huancayo, in Peru; Désiré Tsarahazana, archbishop of Toamasina, Madagascar; Thomas Aquino Manyo Maeda, archbishop of Osaka, Japan. Finally, three Cardinals over eighty who, as Pope Francis said last May 20, have distinguished themselves for their service to the Church. These are: Sergio Obeso Rivera, archbishop emeritus of Xalapa, Mexican; Toribio Ticona Porco, prelate emeritus of Corocoro, Bolivian; Aquilino Bocos Merino, Spanish Claretian, the only non-bishop among the new cardinals. The participation of Dr. Rezan Kader, testifies the strong relations between the regional government of Kurdistan and the Holy See.